A Modest Independence just received a fantastic advance review from Kirkus Reviews, which reads, in part: “As always, Matthews’ attention to historical accuracy is impeccable…Strong, smart characters and a daring quest result in a Victorian love story with a charmingly modern sensibility.” You can read the whole review HERE. 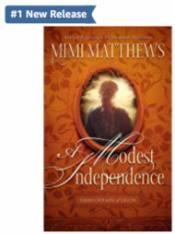 Barnes and Noble Press has chosen A Modest Independence as one of their favorite new and upcoming releases for spring! You can see the complete list of books HERE. My upcoming Victorian romance novel A Modest Independence has been reviewed in Library Journal! The reviewer writes that “Fans of the series will enjoy exploring secondary characters’ lives and the truly heroic compromises Tom makes to be with the woman he loves.” You can read the review HERE. The Matrimonial Advertisement (Parish Orphans of Devon, Book 1) is a Kindle Daily Deal! Today only, you can purchase the eBook at Amazon for $1.49. A Modest Independence (Parish Orphans of Devon, Book 2) is up on NetGalley! If you’re a book reviewer, you can now request a review copy HERE. A Modest Independence will be released on April 23 and is now available for pre-order. Audible has bought the audio rights to A Modest Independence! No news yet on who the narrator will be. I’ll keep you posted! My publisher, Pen and Sword Books UK, has sold the Korean rights to my non-fiction animal history book The Pug Who Bit Napoleon! Not sure when the translation will be out, but I’ll keep you posted! A Modest Independence (Parish Orphans of Devon, Book 2) is now ranked as a #1 New Release at Amazon! It will be out on April 23 and is currently available for pre-order for just $2.99. I’m thrilled to announce that my Victorian Christmas romance A Holiday By Gaslight is now available on audiobook, performed by British actor Alex Wyndham!! For buy links, see the A Holiday By Gaslight book page. Or, for more info on Alex, click through to my blog post HERE. I just learned that Barnes & Noble press has chosen The Matrimonial Advertisement as one of their 20 favorite Indie books of 2018!!! You can see the full list HERE. 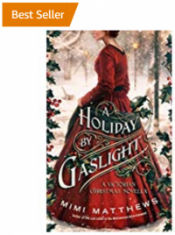 My Victorian Christmas novella A Holiday By Gaslight is a Top Pick at The Romance Reviews! You can read the wonderful review HERE. There’s more news about this title coming soon. Stay tuned! A Victorian Lady’s Guide to Fashion and Beauty is out today in paperback in the U.S.! For more information, including reviews and buy links, click through to the A Victorian Lady’s Guide to Fashion and Beauty book page HERE. 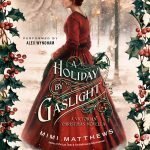 Bookish.com has chosen the cover of A Holiday By Gaslight as one of their Brilliant Book Covers of November 2018! You can view the complete list HERE. A Holiday By Gaslight is now a #1 Bestseller on Amazon! On launch day, it reached #1 in multiple categories, including Victorian romance. It also made the list of top 100 books at Barnes & Noble! Thank you to everyone who bought a copy and helped to make release day so successful. 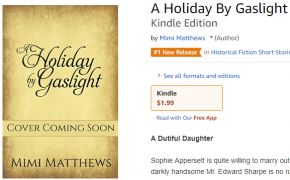 It’s release day for A Holiday By Gaslight! It’s now available everywhere in ebook and paperback. If you purchase a copy, do let me know so I can thank you personally. Hope you all enjoy it! I’m over at USA TODAY’s Happy Ever After blog this morning with an exclusive excerpt of A Holiday By Gaslight! It will be out tomorrow in ebook and paperback. The Matrimonial Advertisement is now available in serial format at Radish Fiction! The first 9 episodes are out today. If you have the app, you can read it on your mobile device! The Matrimonial Advertisement just received a spectacular review from Publishers Weekly, which calls it an “impressive Victorian romance” that “sparkles with chemistry and impresses with strong character development…an excellent series launch.” You can read the whole review HERE. A Holiday By Gaslight just received a great advance review from Kirkus Reviews, which reads, in part: “Matthews’ novella is full of comfort and joy—a sweet treat for romance readers that’s just in time for Christmas.” If you don’t mind spoilers, you can read the whole review HERE. I’m super excited to announce that Audible will be releasing The Matrimonial Advertisement audiobook as a CD! It will be out January 1st. In the meanwhile, you can find it in ebook, paperback, and digital audiobook. 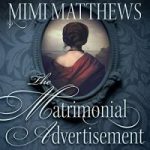 The audiobook of my Victorian romance The Matrimonial Advertisement is out today! You can purchase it at Amazon or directly from Audible. My upcoming Victorian romance novel A Holiday By Gaslight has just received a STARRED review from Library Journal! The reviewer writes, in part, that “readers will easily fall for Sophie and Ned in their gaslit surroundings,” You can read the review HERE. A Holiday By Gaslight is a featured book this week on the NetGalley homepage! If you’re a book reviewer, you can request a review copy HERE. A Holiday By Gaslight will be released on November 13 and is now available for pre-order. A Holiday By Gaslight is up on NetGalley! If you’re a book reviewer, you can now request a review copy HERE. A Holiday By Gaslight will be released on November 13 and is now available for pre-order. I’m over at USA Today’s Happy Ever After blog this morning for the exclusive cover reveal of my new Victorian Christmas novella A Holiday By Gaslight. You can click through to the USA Today website HERE. I hope you’ll all stop by and have a look! A Holiday By Gaslight is now ranked as the #1 New Release in Historical Fiction Short Stories at Amazon! It will be out on November 13 and is currently available for pre-order for just $1.99. It’s release day for The Matrimonial Advertisement! To celebrate, I’m over at USA Today this morning for a rapid-fire interview with the fabulous Joyce Lamb. You can read the interview HERE. The Matrimonial Advertisement has received a fantastic 5-star review from Long and Short Reviews this morning. The reviewer writes, in part: “Everything I look for in a book was incorporated in this romance…The plot was absolutely riveting from the first page to the last,” What a great way to start the day! Barnes and Noble Press has chosen The Matrimonial Advertisement as one of their featured reads for August/September! You can see the complete list of books HERE. My upcoming Victorian romance novel The Matrimonial Advertisement has been reviewed in Library Journal! The reviewer writes that “Matthews’ (The Viscount and the Vicar’s Daughter) has a knack for creating slow-building chemistry and an intriguing plot with a social history twist.” You can read the review HERE. A Victorian Lady’s Guide to Fashion and Beauty is out today in eBook! For more information, including reviews and buy links, click through to the A Victorian Lady’s Guide to Fashion and Beauty book page HERE. The Matrimonial Advertisement is going to be an audiobook! Audible has just bought the audio rights. I am so excited! For more info, see my blog post HERE. 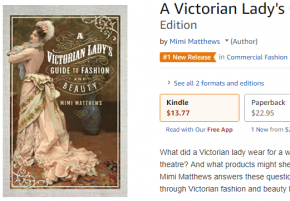 A Victorian Lady’s Guide to Fashion and Beauty is now ranked as the #1 New Release in Commercial Fashion at Amazon! It is currently on pre-order and will be released in eBook on July 31. The UK paperback will be out in August. The Viscount and the Vicar’s Daughter audiobook was released today by Tantor Audio! You can purchase it at Amazon, Audible, iTunes, or direct from Tantor. The Matrimonial Advertisement is a featured book this week on NetGalley! If you’re a book reviewer, you can request a review copy HERE. The Matrimonial Advertisement will be released on September 4 and is now available for pre-order. There’s a truly spectacular review of The Matrimonial Advertisement up today at the Chicks, Rogues and Scandals book review blog! You can read the whole review HERE. The Matrimonial Advertisement just received a wonderful advance review from Kirkus Reviews, which reads, in part: “Matthews’ series opener is a guilty pleasure…An enjoyable love story that dares to dip a toe into bleak social and political history.” If you don’t mind spoilers, you can read the whole review HERE. The Matrimonial Advertisement is up on NetGalley! If you’re a book reviewer, you can request a review copy HERE. The Matrimonial Advertisement will be released on September 4 and is now available for pre-order. Today, I’m thrilled to be over at USA Today’s Happy Ever After blog with Joyce Lamb for the exclusive cover reveal of my next Victorian romance novel, The Matrimonial Advertisement. You can click through to the USA Today website HERE. I hope you’ll all stop by and have a look! Today, my Victorian romance The Lost Letter sold its 10,000th copy! I am thrilled beyond belief and so very grateful to you all for taking a chance on a debut fiction author. The Lost Letter was released on September 19, 2017. I had high expectations for it, but I never dreamed it would do so well. *In other news: The Lost Letter audiobook was released today by Tantor Audio! You can purchase it at Amazon, Audible, iTunes, or direct from Tantor (where it is now on sale for only $6.99). The eBook version of my Victorian romance novel The Lost Letter is on sale this week for 99¢! The sale runs from June 04-10 at Amazon, Barnes & Noble, iTunes, and Kobo. If you haven’t yet read The Lost Letter, now’s a good time to pick up a copy! The first audio sample of The Lost Letter audiobook is out! Click through to the Tantor Audio website to hear Justine Eyre reading a scene from Chapter One!! I’m thrilled to announce that my audio publisher, Tantor Media, has cast Justine Eyre to narrate both The Lost Letter and The Viscount and the Vicar’s Daughter. Justine has done the narration for some really fantastic historical romance authors, including Amanda Quick, Eloisa James, and Tasha Alexander. She’s the actress I requested and I feel so lucky she’s agreed to narrate my novels. You can read more about her HERE. 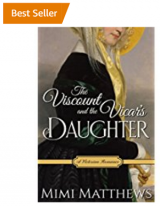 The Viscount and the Vicar’s Daughter is now a #1 Bestseller on Amazon! Thank you to everyone who bought a copy. I am more grateful than I can express. If you haven’t yet read The Viscount and the Vicar’s Daughter, you can learn more about it HERE. This month’s print edition of All About History magazine features an author Q&A with me about The Pug Who Bit Napoleon! The Pug Who Bit Napoleon: Animal Tales of the 18th & 19th Centuries is out today in the USA! For more information, including reviews and buy links, click through to The Pug Who Bit Napoleon book page HERE. The Viscount and the Vicar’s Daughter has received a fantastic 5-star review from Long and Short Reviews. The reviewer writes, in part: “Unexpected and enthralling are the best words to describe Mimi Matthews’ romance The Viscount and the Vicar’s Daughter…I can’t fault this one: it’s the best romance I have read in ages.” What a way to start the week! The Lost Letter and The Viscount and the Vicar’s Daughter are going to be audiobooks! Tantor Media has just bought the audio rights to both titles. I am beyond excited! For more info, see my blog post HERE. I’m over at the fabulous Rakes and Rascals blog today for an In the Spotlight author interview. There’s even a picture of my horse (and one of my cats!). You can read the interview HERE. Do stop by and say hello! The Pug Who Bit Napoleon: Animal Tales of the 18th and 19th Centuries has been reviewed in this month’s edition of Booklist! You can read the review in its entirety in the February 2018 print edition or at Booklist Online. My debut Victorian romance novel The Lost Letter is now an Amazon bestseller!!! Thank you to everyone who bought a copy. I am more grateful than I can express. If you haven’t yet read The Lost Letter, you can learn more about it HERE. Today, I’m thrilled to be over at USA Today’s Happy Ever After blog with Joyce Lamb to share an exclusive excerpt of my new Victorian romance novel, The Viscount and the Vicar’s Daughter. You can click through to the USA Today website HERE. I hope you’ll all stop by and have a look! In other news, The Lost Letter is on sale this week for only $0.99 at Amazon and Amazon UK! The sale runs from January 22-January 29. If you haven’t already read The Lost Letter, this is a great time to pick up an eBook at a reduced price. My Victorian romance The Lost Letter got a lovely mention on the January best list at Five Directions Press! What an honor to be included with so many impressive books. Today is the official cover reveal for A Victorian Lady’s Guide to Fashion and Beauty! You can see the beautiful cover HERE. A Victorian Lady’s Guide to Fashion and Beauty will be released by Pen and Sword Books in July 2018. I’m offering one signed, paperback copy of my non-fiction history book The Pug Who Bit Napoleon: Animal Tales of the 18th and 19th Centuries via a Goodreads giveaway. This giveaway runs from January 9 – January 30 and is open to readers in the United States. To enter, click through to the Goodreads Book Giveaway page. My upcoming Victorian romance novel, The Viscount and the Vicar’s Daughter has been reviewed in Library Journal! The reviewer writes that “Matthews (The Lost Letter) delivers a sweet, fast-paced read that will be appreciated by fans of Victorian romance.” You can read the review HERE. The Viscount and the Vicar’s Daughter will be released on January 23. I’m offering one signed, advance paperback copy of my newest Victorian romance The Viscount and the Vicar’s Daughter via a Goodreads giveaway. This giveaway runs from January 3 – January 18 and is open to readers in the United States. To enter, click through to the Goodreads Book Giveaway page. The February issue of RT Book Reviews includes a lovely four star review of The Viscount and the Vicar’s Daughter. The reviewer writes, in part, that “Tristan and Valentine’s romance is tender, genuine and passionate” and calls the novel “A wonderfully romantic read.” You can read the full review HERE. I’m offering two signed, advance paperback copies of my newest Victorian romance The Viscount and the Vicar’s Daughter via a Goodreads giveaway. This giveaway runs from December 5 – January 2 and is open to readers in the United States, United Kingdom, and Canada. To enter, click through to the Goodreads Book Giveaway page. The Viscount and the Vicar’s Daughter just received an absolutely wonderful review from Kirkus Reviews, which reads, in part: “Matthews’ tale hits all the high notes of a great romance novel…Cue the satisfied sighs of romance readers everywhere.” You can read the whole review HERE. My article on Companion Dogs as Seers, Healers, and Fairy Steeds is up today at the #FolkloreThursday website! The Victorian Web has a lovely review of The Pug Who Bit Napoleon! You can read the entire review HERE. My Victorian romance The Viscount and the Vicar’s Daughter has received 5-stars from Readers Favorite reviews! For more information, including pre-order links, please click through to The Viscount and the Vicar’s Daughter book page. I’m offering one signed paperback copy of The Lost Letter via a Goodreads giveaway. This giveaway runs from November 16-30 and is open to readers in the United States. To enter, click through to the Goodreads Book Giveaway page. My Victorian romance The Lost Letter has received 5-stars from Readers Favorite reviews! For more information, including order links, please click through to The Lost Letter book page. The eBook version of my Victorian romance novel, The Lost Letter, is now FREE for a limited time on Kindle Unlimited! If you do not have an Amazon.com Kindle Unlimited membership, you can still purchase the eBook for only $2.99. You can click through to the Amazon page HERE. My next Victorian romance novel, The Viscount and the Vicar’s Daughter, is now available for pre-order! Set in 1861 England, it is the story of a world-weary rake and a prim vicar’s daughter who meet during a notorious holiday house party in Yorkshire. To learn more, please click through to The Viscount and the Vicar’s Daughter book page. Today, I’m thrilled to be over at USA Today’s Happy Ever After blog with Joyce Lamb for the exclusive cover reveal of my next Victorian romance novel, The Viscount and the Vicar’s Daughter. You can click through to the USA Today website HERE. I hope you’ll all stop by and have a look! I’m over at Jackie Mantey’s fantastic blog today for an interview about The Lost Letter and all things Victorian. Do stop by and have a look! You can read the interview HERE. The Pug Who Bit Napoleon is up on NetGalley! If you’re a book reviewer, you can request a review copy HERE. The Pug Who Bit Napoleon will be released on November 30 and is now available for pre-order. I’m at the fabulous Get Lost in a Story blog today for another author interview. There’s also an exclusive excerpt of The Lost Letter, as well as a book giveaway. Stop by and leave a comment for a chance to win! My article on Beauty and the Beast: From French Folklore to Victorian Romance is up today at the #FolkloreThursday website! I’m over at editor Ali Williams’ website today talking about how I use historical research in my Victorian romance novels. You can read the article HERE. It’s release day for The Lost Letter! I’m over at USA Today this morning being interviewed by the wonderful Joyce Lamb. There’s even some pics of my dogs and cats! You can read the interview HERE. In other release day news, Bookish.com has chosen The Lost Letter as one of the eight hot new titles their editors are most excited to add to their TBR shelves! You can view the complete list HERE. My article on The Dangers of the Victorian Pleasure Garden is up today at the English Historical Fiction Authors’ blog. To learn more about the sometimes fatal accidents which befell Victorian performers at Cremorne Gardens, stop by and have a look! My upcoming Victorian romance novel, The Lost Letter, has been reviewed in Library Journal! The reviewer calls it a “A fast and emotionally satisfying read, with two characters finding the happily-ever-after they had understandably given up on. A promising debut.” You can read the wonderful review HERE. The Lost Letter will be released on September 19. I’m offering two signed, advance paperback copies of The Lost Letter via a Goodreads giveaway. This giveaway runs from September 5-17 and is open to readers in the United States, United Kingdom, and Canada. To enter, click through to the Goodreads Book Giveaway page. My upcoming Victorian romance novel, The Lost Letter, is a Top Pick at The Romance Reviews! You can read the wonderful review HERE. The Lost Letter will be released on September 19. The October issue of RT Book Reviews includes a lovely four star review of The Lost Letter . The reviewer writes: “This sweet story is the perfect quick read for fans of Regency romances as well as Victorian happily-ever-afters, with shades of Austen and the Brontës that create an entertaining blend of drama and romance.” You can read the full review HERE. My article on The Vulnerable Victorian Governess is up today at the English Historical Fiction Authors’ blog. 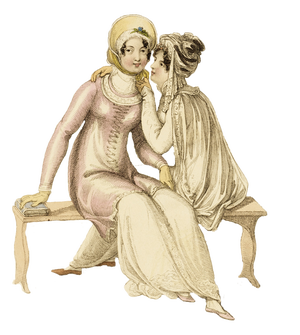 To learn more about the dangers facing young governesses in the 19th century, stop by and have a look! I’m offering three signed, advance paperback copies of The Lost Letter via a Goodreads giveaway. This giveaway runs from August 2-30 and is open to readers in the United States, United Kingdom, and Canada. To enter, click through to the Goodreads Book Giveaway page. The storyboard for The Lost Letter is now live on Pinterest! For a look at images inspired by characters and scenes from my novel, click through to the Pinterest storyboard HERE. My new Victorian romance novel, The Lost Letter, is now available for pre-order! Set in 1860 England, it is a beauty and the beast-inspired love story, featuring an impoverished governess and a soldier who was injured during the Sepoy Rebellion. To learn more, please click through to The Lost Letter book page. The Pug Who Bit Napoleon: Animal Tales of the 18th and 19th Centuries is now available for pre-order in the United Kingdom! It will be released in the UK on November 30, 2017. The American release dates will follow soon after. I’ll update as soon as I have them! My article on Mermaid Folktales in 19th Century History is up today at the #FolkloreThursday Website! #FolkloreThursday is one of the most popular sites (and hashtags!) for sharing fairy tales, myths, and legends. I’m so excited to see my article there. My article on Dog Funerals in the Late Victorian Era is up today at the Journal of Victorian Culture Online! JVC Online is an academic website which features scholarly articles, essays, and commentary on Victorian studies. I’m thrilled to see my article included there. My article on Nineteenth Century Fortune-Telling: From the Drawing Room to the Court Room is up today at The Victorian Web. The Victorian Web is one of the oldest academic and scholarly websites and I’m very proud to contribute another piece to them. Last week I signed a multi-book deal with Pen and Sword Books! My first non-fiction book, titled The Pug Who Bit Napoleon: Animal Tales of the 18th and 19th Centuries, will be filled with lots of fabulous animal stories and illustrations. You can expect it in late 2017. My second non-fiction book, titled A Victorian Lady’s Guide to Fashion and Beauty, will be released by Pen and Sword Books in 2018. More details to come! My newest novel, The Lost Letter, is one of four finalists in the 2016 Beau Monde Royal Ascot contest! The Royal Ascot was the second of two contests in which I entered The Lost Letter this year and I am beyond pleased with the results. My articles on 19th century romance, literature, and history are going into syndication! You can now read them each week at Bust Magazine. My newest novel, The Lost Letter, has just placed 2nd in the NTRWA Great Expectations contest! This is the first contest I’ve ever entered and I’m so pleased with the positive response. MimiMatthews.com has been chosen as an Editor’s Pick on WordPress Discover! Formerly known as Freshly Pressed, Discover is a space where WordPress editors highlight the best content published with WordPress. The editor who chose me, said that my site “strikes a great (and rare!) balance between solid research and engaging writing.” I think this is one of the best compliments ever! 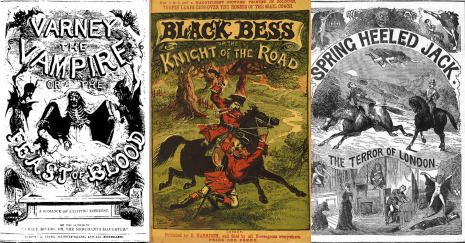 My article on Penny Dreadfuls, Juvenile Crime, and Late-Victorian Moral Panic is up today at The Victorian Web. The Victorian Web is one of the oldest academic and scholarly websites and I am quite honored to see my article included there amongst so many other fabulous 19th century resources. I’ll be updating this page regularly with news on my books, articles, and research. Stay tuned!